Following the success of the January 25 anniversary mass protests on Wednesday, almost 60 political groups and parties have announced their participation in Friday, 27 January protest called Friday of Dignity or Second Friday of Rage. The main demands, the groups say, are the end to the military rule and the immediate handover of power to a civilian government. 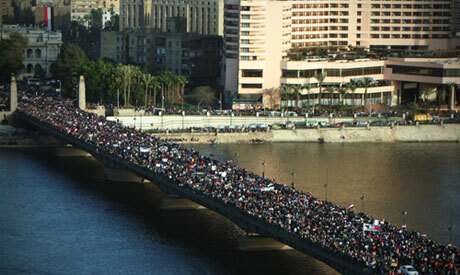 Political groups calling for the protests include the April 6 Movement, Socialist Popular Alliance Party, the Wa’i (“Awareness”) Party, the Popular Movement for the Independence of Al-Azhar, the Justice and Freedom youth movement, the Free Front for Peaceful Change, the Participation Movement and the Maspero Protesters Movement, among others. April 6 Youth Movement and National Front for Justice and Democracy have also stated that they will stay after the Friday’s demonstrations and stage an open-ended sit-in in Tahrir Square. Following Wednesday’s festivities, which saw hundreds of thousands in the streets, tens of people decided to remain on Tahrir until the expected demonstrations at the weekend. Groups from the Muslim Brotherhood, who initially said they would leave the square at 4pm, also stayed overnight. “We are staying here to take care of our stage in preparation for Friday,” a member of Muslim Brotherhood told an Ahram Online correspondent in the early hours of Thursday morning. The Islamist group led the festivities on the square yesterday, despite publically distancing itself from anti-SCAF sit-ins in July, November and December. A smaller sit-in was also formed on Wednesday night in front of Maspero, the state-owned television and radio headquarters. Protesters marched to the television building in the afternoon calling for the purification of state media, which they believe, has been spreading lies since the revolution began. This Friday will mark the anniversary of the Friday of Rage: one of the most significant dates of the ongoing revolution. 28 January, 2011 was the first instance that the Egyptian military attacked protesters resulting in 20 deaths. The police, who traditionally dealt with demonstrations, had vacated the streets and many prisons were left open. In the ensuing security vacuum the former president Hosni Mubarak ordered the military to take control. No mention of yesterday's perverts? I can't believe that you haven't mentioned the shocking violations on female decency took place yesterday in Tahrir (to the point where a woman was stripped of her trousers and molested). Refusing to report what is going wrong with the demonstrations is tantamount to compliance with these horrific acts of indignity. We must raise awareness on this out of respect for our women, our revolution and ourselves. Sexual harassment has gone on far too long in Egypt and I for one will not be proud to call myself Egyptian until it is stopped. Right. On the other hand, such violent acts would only serve certain Islamist MPs as a justification for imposing an “Islamic dress code” (niqab?) on women, which would not solve the problem since the key to it lies in raising educational standards, not in curbing personal freedoms. Finding the fault with the women (as is the usual reaction in Egypt) is the wrong approach.